Members of LATFOR, the legislative task force charged with drawing state district lines. Black, Latino, and immigrant Long Islanders broadcasted the need for fair district lines at a February 9 hearing on New York State redistricting, saying that the proposed districts in areas like Brentwood and Hempstead diminish the voting power of communities of color. 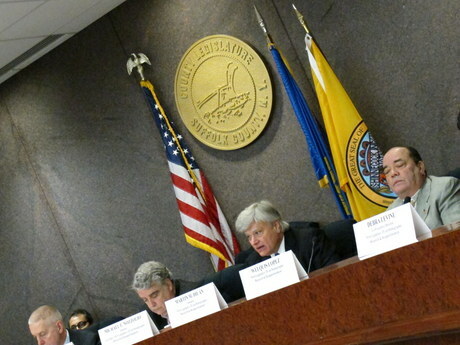 The hearing, held at the Suffolk County Legislature in Smithtown, drew a diverse mix of Long Island residents, with some calling for revised lines that would aid Republicans and others supporting lines favorable to Democrats. Regardless of political interest, nearly all testifying at the hearing agreed that LATFOR, the legislative task force commissioned with drawing district maps, unfairly valued partisan interests over demographic data when drawing certain Senate and Assembly district lines. Early in the hearing, several Brentwood residents criticized current district lines for fracturing the voting power of their community.